It’s 2019, has your company upgraded to the advanced performance of Fusio-Tech UV Black Piping by aquatechnik NA? This product has broken ground as the first fusible polypropylene pipe solution that has protection from UV rays included! Your team will instantly see a substantive drop-off in the number of labor hours plus a considerable boost in installation when handling fusion pipe outdoors. Additionally, pipe painting to protect from those aforementioned UV rays becomes practically unnecessary. With its durability to ensure performance over the long term and the ability to withstand different harsh weather conditions, Fusio-Technick UV Black Piping is the evolution of polypropylene pipe. Fusio-Tech UV stabilizer has tested exhaustively to virtually guarantee what may just be the most advanced level of UV resistance available in 2019. The pipe can is also cement, plaster, and electrochemical reaction resistant. In addition to making outdoor installation easier, the pipe can be welded or fused without pipe or fittings treatment. Use it to move hot or cold potable or non-potable fluids, for applications involving industrial, this pipe is one of a kind. 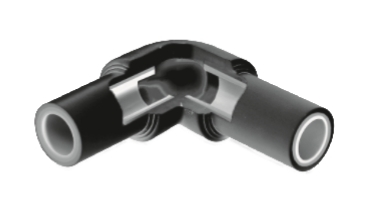 Want to learn more about Fusion-Tech UV Black Piping? Visit the MIMECO product page or call us and we will tell you all about it.